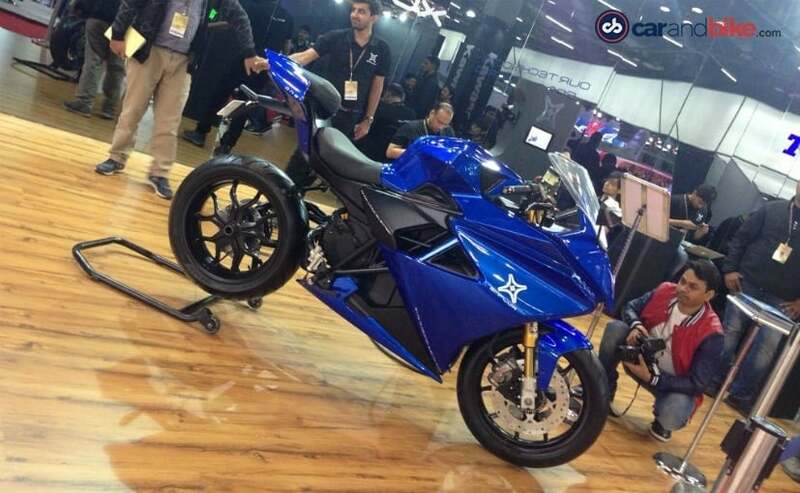 Bengaluru-based tech start-up Emflux Motors has unveiled India's first electric superbike, called the Emflux One at the Auto Expo 2018. The Emflux One is powered by Samsung Lithium Ion 9.7 kWh high power cells with a 60 kW AC induction motor, with power limited to 53 kW from the controller. The Emflux One is a full-faired electric superbike with top-of-the-line components like Brembo brakes with dual-channel ABS, single-sided swingarm, Ohlins suspension and fully connected smart dashboard with artificial intelligence capabilities. The pre-orders for the Emflux One will start in July 2018, with the first deliveries to begin in April 2019. The Emflux One has a top speed of 200 kmph with an acceleration of 0-100 kmph in just 3 seconds. The motor produces 71 bhp of power and 84 Nm of peak torque, which has been electronically limited to 75 Nm. The design and circuits of the Emflux One have been developed completely in-house by Emflux Motors. Once launched, the Emflux One will be priced between ₹ 5.5 - 6 lakh and will be showcased at the company's experience centres in Bengaluru, New Delhi and Mumbai. Purchases of the Emflux One will be completely online through digital payment methods. Emflux is also working on a naked street model, called the Emflux Two, which will be launched subsequently. According to Emflux officials, the Emflux One will have a range of around 200 km on standard operating conditions. The company intends to start exports of the electric motorcycles as well, and currently discussions are on with distributors from different countries across Europe, Canada, Mexico and Australia.